FC Sparx (A) were crowned champions of the Silver Jubilee edition 7-aside Football Tournament. In the final FC Sparx beat AKFC in the tie-breaker 3-2. 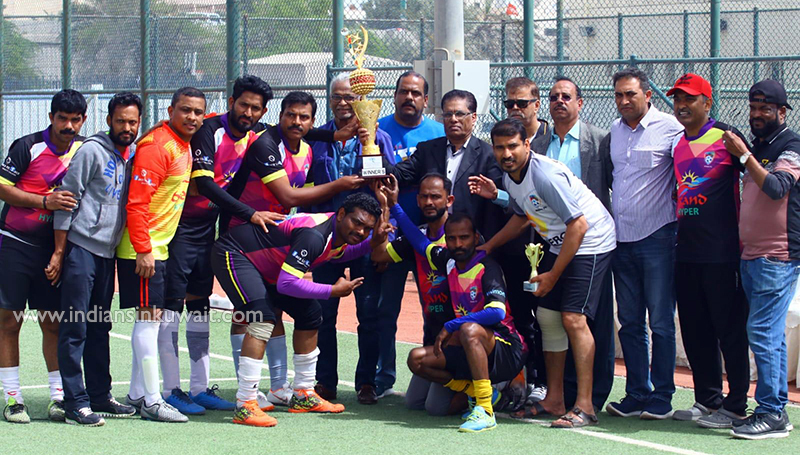 The tournament, open for Indian expatriates aged 35 and above, was organized by Kuwait Indian Football Federation (KIFF) and played at Bayan Grounds recently. 16 exciting teams took part in the one-day tournament.In a special gesture, KIFF dedicated the tournament as a tribute to late Alcantra Barretto and Cajetan Godinho, two ex-KIFF footballers who passed away in Goa recently. Sparx goalkeeper Mansour was a star in the final saving a penalty during field-play, and also stopping a crucial one in the tie-breaker. 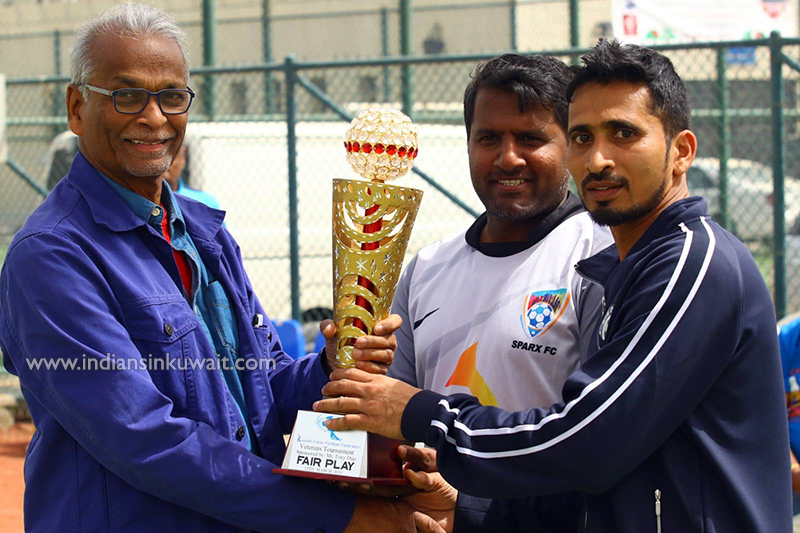 FC Sparx captain and president Noushad Palliyalil also dazzled in the tournament. Earlier in the semi-finals, Sparx overcame Indian Strikers by 2 goals. FC Sparx comprised of Mansour, Prakash, Sajan, Rasik, Vinod, Uraij, Sameer, Reji Philip, Babynoushad Palliyalil, Sunin and Iqbal. Runners-up AKFC consisted of Arshad, Riyas, Shaiju, Salu, Aneesh, Niyas, Muneer, Jamsheed, Ubaid, Haroon, Saleem and Iqbal. Five-time Kuwait Indian Football Federation (KIFF) President Mr. Fidelis Fernandes was chief guest at the event and spoke on the occasion. He was introduced to the finalists by KIFF President Derick Gomindes. Mr. Fidelis while congratulating the teams, praised KIFF committee for organizing a grand tournament. Other dignitaries present on the occasion included Carmo Santos, Tony Alphonso, Michael Pereira, Robert Bernard, Norman Noronha, Tony Dias, etc. Watching some of the yesteryear stars was very attractive for the eyes. The event was made all the more spectacular with expert commentary by Gasper Crasto. A number of glittering trophies and medallions were awarded to the finalists. Matches were officiated by Robert Bernard, Rafi Islahi, Rosario Colaco, Bhavu, Shafeeq, Sameer, etc. Prizes were presented at the hands of Fidelis Fernandes, Tony Alphonso, Carmo Santos, Tony Dias, Norman Noronha and Derick Gomindes. In a vote of thanks proposed, KIFF President Mr. Gomindes thanked the sponsor Mr. Tony Dias, all participating teams, KIFF affiliates and officials, and everyone who rendered their help in making the tournament a success. Mr. Gomindes showered special praise upon Mr. Tony Dias for his support towards the tournament over the years. Apart from trophies for Winners, Runners-up, the winners and runners-up were awarded glittering individual trophies. 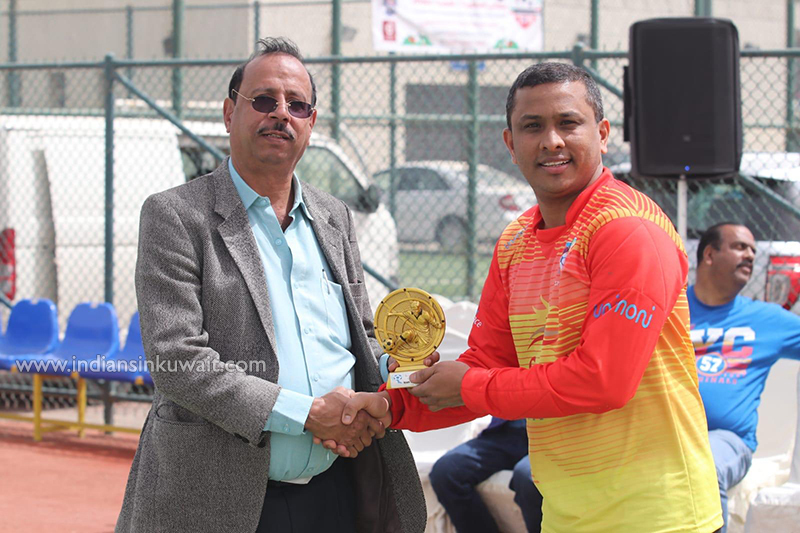 FC Spax (B) were awarded the prestigious Fair Play Trophy while goalkeeper Mansour (FC Sparx) won the Man of the Match (final). Meanwhile, GOA Maroons will be organizing another Veterans tournament for Indian expatriates above 40 years of age. The tournament will be held at Bayan Grounds on 5th April 2019.